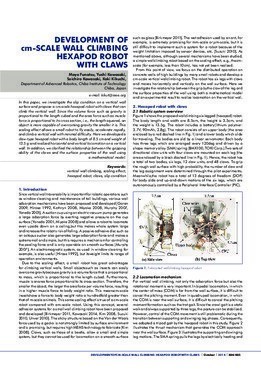 In this paper, we investigate the slip condition on a vertical wall surface and propose a cm-scale hexapod robot with claws that can climb the vertical wall. Since the volume force such as gravity is proportional to the length cubed and the area force such as muscle force is proportional to its cross section, i.e., the length squared, an object is more capable of overcoming gravity the smaller it is. This scaling effect allows a small robot to fly easily, accelerate rapidly, and climb a vertical wall with minimal difficulty. Here we developed a claw-type hexapod robot with a body length of 8.5 cm and weight of 13.5 g and realized horizontal and vertical locomotion on a vertical wall. In addition, we clarified the relationship between the gripping ability of the claws and the surface properties of the wall using a mathematical model.